Over the last couple of months, I've been thinking and writing a lot about the defensive posture of the United States during the Cold War. From the Second World War onwards, there was an enormous buildup of organization and manpower to become one of the dominant powers on the planet. During the 1950s, there was a transition in power from a more conventional air power, a bomber force, to a deterrent based one with ICBMs. The military-industrial complex grew to meet demand. Every level of society was touched in some degree, whether it was through looking at the television screen at astronauts in space, to the very highways that we depend upon. At my alma mater, I took a course in institutional history, where I learned much about the school's founder, Alden Partridge. A huge supporter of experiential learning, I found that this sort of learning is an important one. My geology courses emphasized field work, and I absolutely loved going into the field to see what I was studying in action. While I've done quite a bit of reading thus far about the Cold War, I've also found a couple of ways to find tangible evidence on the Cold War in my surroundings. 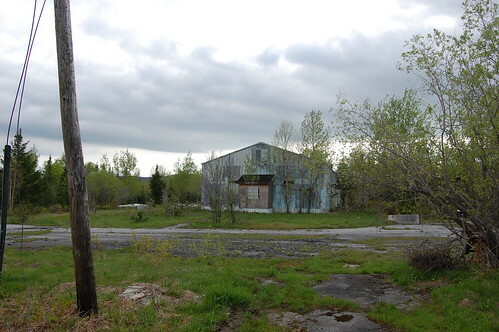 Last spring, a friend of mine and I drove up to East Haven, in the Northeast Kingdom, where there is an abandoned Radar Facility, named the Lyndonville Air Force Station. Commissioned in 1952 by the US Air Force, it was up and running in 1955, during the height of the Cold War, and at the beginning of the rise of the rockets as a major defensive tactic for the United States. The ground based radar station is just one of many that were scattered around the United States at the time, and undoubtedly would have been used to seek out Russian planes or missiles coming across the Atlantic Ocean. 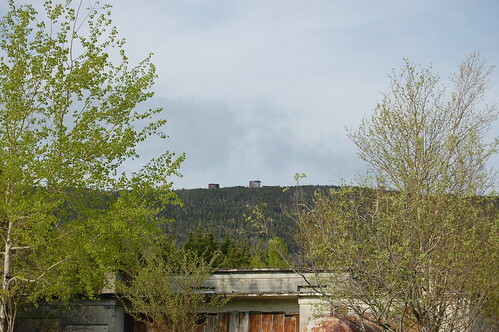 Our hike up the mountain found a deserted, well preserved road into the middle of the woods, with a base camp to support the base staff, and a separate facility a mile up the road that housed the radar installation. (Unfortunately, it was getting late and we weren't able to visit that part of the site). What the station helped to demonstrate was some of the historical context to how the United States defended itself. The radar station in and of itself was most likely not as important, but it made up part of a system that helps to show the reach of the military at this time. Between the fall of Nazi Germany and the rise of the Soviet Union, the United States had utilized a massive military presence in the world - an unprecedented show of force in the world at that time, one that extended not only to military assets capable of striking far off nations, it implemented a large network of logistical and defensive support that was much, much larger. The site was abandoned in 1963, and remains in East Haven to this day, a lonely, rundown reminder of the Cold War, and how it affected everything.